Combining theatrics and an outrageously flamboyant stage persona with his fine natural-born talent (he possessed one of the greatest voices in all of music and penned some of pop’s most enduring and instantly recognizable compositions), one of rock’s greatest all-time entertainers/showmen was unquestionably Queen vocalist Freddie Mercury. Born Farrokh Bulsara on September 5, 1946, in Zanzibar to Persian parents (his father worked as a high court cashier for the British government), young Farrokh soon adopted the name Freddie by fellow classmates while attending an English boarding school. Freddie soon discovered his love for art and music, both subjects that he explored voraciously (he began taking piano lessons around this time), putting his newly found piano talent to use as he played in rock & roll bands with friends. Due to political upheaval in Zanzibar, Freddie and his family fled Zanzibar for England in 1964. Back in England, Freddie enrolled in the Ealing College of Art and fell under the spell of guitar wizard Jimi Hendrix. It was while attending Ealing that Freddie befriended a fellow aspiring musician, bassist Tim Staffel, who was a member of a local band called Smile. Freddie soon began attending Smile’s rehearsals and struck up a friendship with the group’s other members, guitarist Brian May and drummer Roger Taylor. Inspired by his new friends, he began playing in bands himself (such as Ibex, Wreckage, and Sour Milk Sea, among others), but instead of just playing piano as he did back in Zanzibar, he began singing. To pay the bills, Freddie opened up a stall on Piccadilly Circus with Taylor, selling clothing geared toward fellow rock musicians. By 1970, Freddie had become frustrated that his music career had yet to blossom, and when he heard that Staffel had left Smile, Freddie promptly took his place, finally uniting musically with May and Taylor. Inspired by the heavy rock of Led Zeppelin/Jimi Hendrix as well as the vocal harmonies of The Beatles and the over-the-top look of the burgeoning glam rock movement (David Bowie and T. Rex), the new group decided to mix up all these influences in one big melting pot, resulting in the formation of Queen. Sensing that it was only natural that a soon-to-be rock star should have an equally grand name, Bulsara soon became Freddie Mercury. The new band honed their sound throughout the early ’70s (ultimately signing with EMI in England and Elektra in the U.S.), and after going through a succession of bassists, finally found a permanent member, John Deacon, just prior to the recording of their first album. But just before the release of Queen‘s self-titled debut in 1973, Freddie issued the solo single “I Can Hear Music”/”Going Back” (with his Queen bandmates backing him) under the pseudonym Larry Lurex. The single sank from view shortly after release, while Queen‘s debut fared little better. 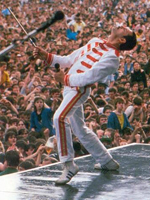 It was during an early Queen show that Freddie’s mic stand accidentally snapped in half, and instead of replacing it, Mercury carried on with the damaged stand, which ultimately became an on-stage trademark for the singer. Dressed in outrageous Zandra Rhodes-designed threads, dolled up in makeup/eyeliner, and wearing black nail polish on his right hand, Freddie instantly stood out from the rest of the then-current rock pack. Although there was speculation about his sexuality throughout his career, Mercury refused to confirm or deny that he was bisexual during his lifetime. 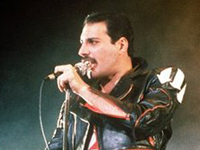 Slowly but surely, Queen built up an enormous and dedicated worldwide following due to their bombastic stage show and such hit releases as 1974′s Queen II and Sheer Heart Attack, but it was the Mercury-penned “Bohemian Rhapsody” off 1975′s breakthrough A Night at the Opera that solidified Queen as one of rock’s top bands. Further hit albums followed: 1976′s A Day at the Races, 1977′s News of the World, 1978′s Jazz, and 1979′s Live Killers, during which Freddie penned such hit songs (and eventual rock radio staples) as “Killer Queen,” “Somebody to Love,” “We Are the Champions,” “Don’t Stop Me Now,” and “Crazy Little Thing Called Love.” By the late ’70s, Freddie had become one of rock’s leading frontmen as his image changed from his early glam rock look to an image that was met with some consternation from fans: he cut his hair short, grew a moustache, and dressed in all leather. In addition to his work with Queen, Mercury fulfilled a longtime dream by performing with the Royal Ballet in October of 1979. The ’80s would prove to be puzzling time for Queen, as they kicked off the new decade with their biggest album yet, The Game — scoring one of 1980′s biggest hits, the dancefloor anthem “Another One Bites the Dust” — and most successful tour. But instead of treating the successful musical experiment as a brief detour, Queen decided to explore dance music more thoroughly on their follow-up, Hot Space, resulting in their worst-selling release since Queen II. While Queen was quickly able to recapture their following everywhere in the world on the strength of such solid releases as 1984′s The Works and 1986′s A Kind of Magic (and a showstopping performance at the mammoth Live Aid benefit concert in 1985), the band’s popularity in the U.S. dwindled considerably. Mercury also issued his first solo album in 1985, Mr. Bad Guy.